Microsoft SQL Server 2008 R2 Enterprise - Including license key with 5 CALs and 1 Server installation. For Windows x86, x64 and ia64. SQL Server 2008 Ent. R2 delivers by helping your organization manage any data, any place, any time. It enables you to store data from structured, semi-structured, and unstructured documents, such as images and music, directly within the database. 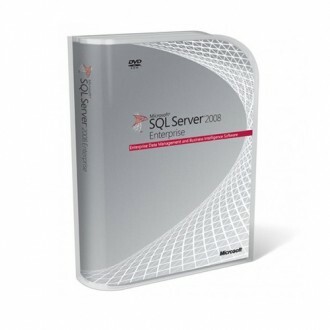 SQL Server 2008 delivers a rich set of integrated services that enable you to do more with your data such as query, search, synchronize, report, and analyze. Your data can be stored and accessed in your largest servers within the data center all the way down to desktops and mobile devices, enabling you to have control over your data no matter where it is stored. SQL Server 2008 R2 Ent. is a comprehensive data management and business intelligence platform that provides enterprise-class scalability, data warehousing, advanced analytics, and security for running business-critical applications. With this edition, you can consolidate servers and perform large-scale online transactional processing and reporting. Manage your infrastructure with automated diagnostics, tuning, and configuration to reduce operational costs while reducing maintenance and managing very large amounts of data. Easily query and analyze large amounts of data in your data warehouse and data marts to transform it into business insight. Run your most demanding mission-critical applications. Reduce time and cost of development and management of applications. Deliver actionable insight to your entire organization. Trusted - Run your most mission-critical applications on a highly secure, reliable, and scalable platform. Reduce storage requirements and increase query performance with data compression and Sparse Columns. Productive - Reduce the cost of managing your data infrastructure while streamlining development of data applications. Access data by defining business entities instead of tables and columns with the ADO.NET Entity Framework. Intelligent - Drive business intelligence throughout your organization, manage reports and analysis of any size or complexity, and empower users by providing powerful visualization and integration with the Microsoft Office system.